The blistering blue star, which existed almost 10 billion years ago, was imaged thanks to a chance alignment that magnified it by a factor of at least 2,000. In a study published today in Nature Astronomy, an international team of researchers announced the discovery of the most distant star ever observed. The team detected the blue supergiant star — which shone when the universe was just one-third its current age — with the help of both the Hubble Space Telescope and an observational phenomenon known as gravitational lensing. “This is the first time we’re seeing a magnified, individual star,” said Patrick Kelly, an astrophysicist of the University of Minnesota and lead author of the new study, in a press release. “You can see individual galaxies out there, but this star is at least 100 times farther away than the next individual star we can study, except for supernova explosions.” The unique discovery not only provides astronomers with insight into the formation and evolution of stars in the early universe, but also the composition of galaxy clusters, and even the very nature of dark matter itself. The light from the record-breaking star, which the team has since nicknamed Icarus, was emitted just 4.4 billion years after the Big Bang. Although the star was undoubtedly bright, being located at such a great distance away would have typically made it impossible to view, even with our most powerful telescopes. Fortunately, “the star became bright enough to be visible for Hubble thanks to a process called gravitational lensing,” said co-author Jose Diego, an astronomer from the Instituto de Física de Cantabria, in a press release. Gravitational lensing is an effect that is predicted by Einstein’s general theory of relatively. It occurs when diverging light rays from a distant object are bent back inward, or lensed, as they pass by an extremely massive object, such as a galaxy cluster. According to the study, when a galaxy cluster serendipitously wanders directly between Earth and a distant background object, gravitational lensing can magnify the distant object by up to a factor of about 50. Furthermore, if there is a smaller, impeccably aligned object within the lensing galaxy cluster, then the background object can be magnified (in a process called gravitational microlensing) by a factor of up to 5,000. 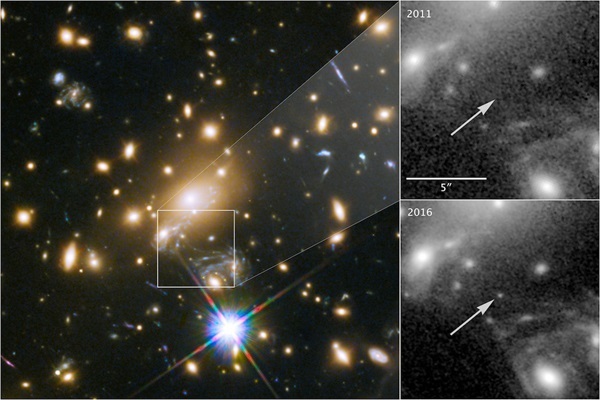 The team initially discovered Icarus while using Hubble to detect and track a known supernova named Refsdal, whose light was predicted to soon be gravitationally lensed by the galaxy cluster MACS J1149, located some 5 billion light-years away. But during their observations, the team was surprised to find another point source was unexpectedly growing brighter within the same field as the expected supernova. While waiting for Refsdal to undergo its predicted lensing event, the researchers accidentally stumbled upon a new star: Icarus. After spotting Icarus, the researchers used Hubble again to measure the star’s spectrum. By breaking down the star’s light into its constituent colors, the team determined that while Icarus was getting brighter, it was not getting hotter. This meant the star was not another supernova like Refsdal, but instead was a distant, non-exploding star that was being not only lensed by the intervening galaxy cluster, but also microlensed by another small, yet massive object within the cluster. “We know that the microlensing was caused by either a star, a neutron star, or a stellar-mass black hole,” said co-author Steven Rodney from the University of South Carolina, in a press release. Therefore, the discovery of Icarus allows astronomers to gather new insights into the makeup of the galaxy cluster itself, he explained. Considering galaxy clusters are some of the most massive and sprawling structures in our universe, learning more about their makeup will inevitably help increase our overall understanding of the universe. No matter what astronomers are able to glean from the distant Icarus, this chance discovery of an extremely distant and magnified star is not likely to be the last. With the upcoming launch of modern, more-powerful telescopes like the James Webb Space Telescope, astronomers are optimistic that microlensing events like this may allow them to study the evolution of the universe's earliest stars in unprecedented detail. Edwin Powell Hubble was an American astronomer. He played a crucial role in establishing the fields of extragalactic astronomy and observational cosmology and is regarded as one of the most important astronomers of all time.